What's up Somebodys? I've got great news! 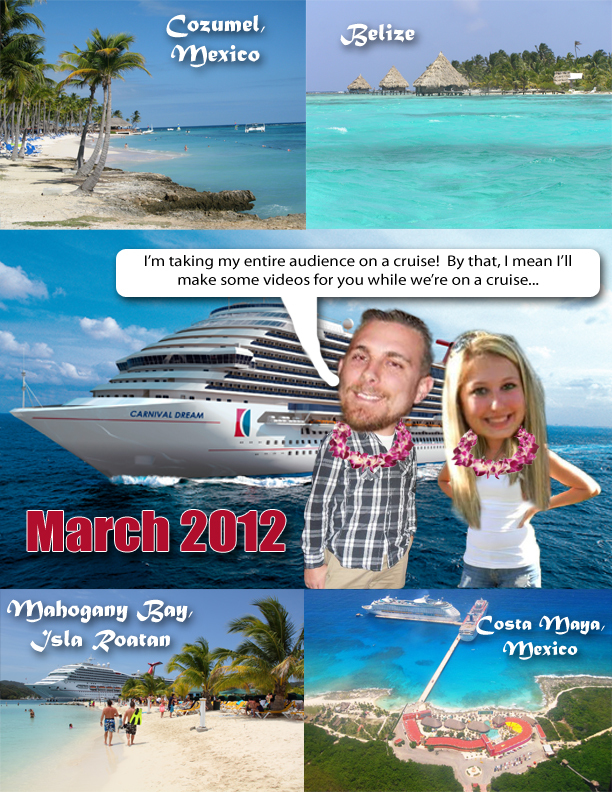 My wife and I are taking you all on a 7 day Caribbean cruise! That's right! If you are subscribed to my youtube channel, my friend on facebook, and/or follow me on twitter, then you get to experience this amazing 7 day adventure aboard the Carnival Dream with us! We'll be making stops in Cozumel - Mexico, Belize, Mahogany Bay - Isla Roatan, and Costa Maya - Mexico! Offers this big usually come from Oprah! If it sounds too good to be true, then maybe I should explain it a little bit better! My wife and I are taking a 7 day cruise. I'm taking my camera. When we return I'm going to edit each day of the vacation into a video and post to my channel. If you're on youtube, facebook, or twitter then you'll get to see the videos! None of My Friends Will Repost This!